As the county seat of Western North Carolina’s oldest county and the seat of the oldest continuous government in the region, Rutherfordton, established in 1787, has a rich history. That history is reflected in the architecture you’ll see on one of the walking tours in North Carolina offered in the downtown historic district, which is listed on the National Register of Historic Places. Explore one of North Carolina’s most unique children’s museums – KidSenses, a variety of independent restaurants – including Bee Happy Eats and Sweets, Rutherford Thai, Gregory’s, Mi Pueblito Mexican Restaurant and The Olive Tree Restaurant and Lounge and opportunities for golf in Western North Carolina at Meadowbrook Golf Club and Cleghorn Plantation Golf Club, in addition to other activities and attractions. Visitors can stay in some of Rutherfordton’s most historic places during their stay. The Carrier Houses Bed and Breakfast features two Victorian houses side by side, an unusual example of North Carolina B&Bs, and both homes are listed on the National Register of Historic Places. The Firehouse Inn, which dates to 1925, was City Hall and served as a fire station and a home for the police department. The first gold dollar minted in the United States, in 1832, was made in Rutherfordton by the Bechtler family. Today, you can go for the gold yourself at Thermal City Gold Mine, which offers recreational North Carolina gold and gem mining or pan for gems at Broad River Gems & Mining Co.
Rutherfordton’s ‘Small Town Friendly’ lifestyle invites a leisurely pace to explore. Rutherfordton’s annual festivals draw enthusiastic crowds. 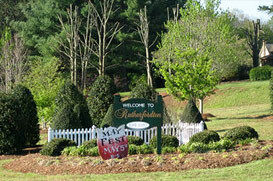 MayFest is one of the NC festivals that offers art, live entertainment and children’s activities. The Hilltop Fall Festival in October features a 5k run and many fun booths and activities for the young participants. Rutherfordton offers a unique portrayal of what it means to live in a Western North Carolina Mountains community and best of all, the taxes are relatively low compared to other desirable mountain towns & cities and the school facilities are unparalleled in the area. Real estate values have held strong throughout the ups and downs of the chaotic markets of recent years and we encourage you to experience the small town charm of Rutherfordton and it’s surrounding areas on your next visit. Washburn Real Estate, Inc. is a leader in Rutherfordton homes for sale, condos for sale, land for sale, vacation homes for sale, second homes for sale and New & Custom-built homes for sale in Rutherfordton.